Methimazole is used to treat hyperthyroidism in cats. 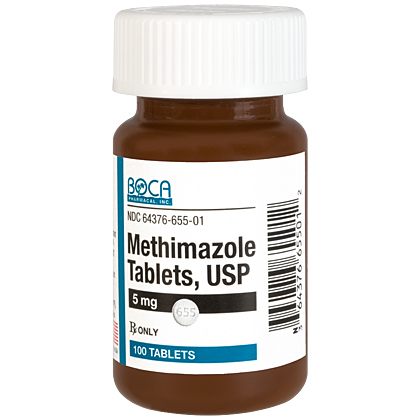 Methimazole is used to treat overactive thyroid (hyperthyroidism). It is also used before thyroid surgery or radioactive iodine treatment. It has largely replaced propylthiouracil in this treatment process since it has a lower incidence of adverse side effects. Methimazole requires a prescription from your veterinarian, and is sold per tablet. Tell your veterinarian if your pet has an allergy to methimazole or if your pet has liver disease, a blood cell disorder, or a weak immune system. Tell your veterinarian if the pet is pregnant or nursing. Inform your veterinarian of any other medications, including vitamins and supplements your pet may be taking while receiving methimazole. Methimazole is a prescription medication not FDA approved for veterinary use; however, it is a commonly accepted practice for veterinarians to use this medication in cats. 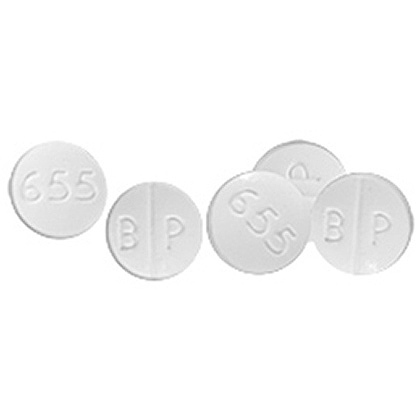 Methimazole is available as a 5mg scored tablet. The usual initial dose for cats is 5mg every 8 to 12 hours. Do not give methimazole to pregnant or nursing animals. Methimazole can increase the risk of bleeding. Methimazole can lower the blood cells that help fight infections. Your veterinarian will need to give blood tests on a regular basis to be sure these blood cells do not get too low. Do not give the pet a "live" vaccine while the pet is taking methimazole. Methimazole is needed for the life of the pet. If the medication is stopped, the symptoms will reappear. How should Methimazole be given? Give this medication exactly as directed by your veterinarian. Do not give in larger amounts, or give it for longer than recommended by your veterinarian. Follow the directions on the prescription label. If you do not understand the directions ask the pharmacist or veterinarian to explain them to you. Methimazole can be given with or without food. Allow plenty of water for the pet to drink. Store methimazole at room temperature away from moisture and heat. Keep this medication away from children and pets. If any of the following serious side effects occur, stop giving methimazole and seek emergency veterinary medical attention; an allergic reaction (difficulty breathing; swelling of the lips; tongue or face; hives). Stop giving methimazole and contact your veterinarian at once if your pet develops any of these serious side effects; fever, chills, body aches; easy bruising or bleeding, unusual weakness; blood in the urine or stools; severe blistering, peeling, and skin rash; nausea, low fever, loss of appetite, dark urine, jaundice. Other less serious side effects may occur. Continue giving methimazole and talk to your veterinarian if your pet experiences headache, drowsiness, dizziness; mild nausea, or vomiting; itching; muscle, joint, or nerve pain; swelling; hair loss. Other side effects may also occur. Talk to your veterinarian about any side effect that seems unusual or bothersome to the animal. What happens if I miss giving a dose of Methimazole? What should I avoid while giving Methimazole to my pet? Do not give the pet a "live" vaccine while the pet is taking methimazole. Contact your veterinarian at once if your pet develops signs of an infection. Tell your veterinarian if your pet is taking theophylline (Theo-Dur), warfarin (Coumadin), digoxin (Lanoxin), a beta blocker such as atenolol (Tenormin), metoprolol (Lopressor), or propranolol (Inderal). Drugs other than those listed may also interact with Methimazole. Talk to your veterinarian or pharmacist before giving any prescription or over the counter medicines. Do not use in pregnant or nursing animals. Methimazole can be given with or without food. Store methimazole at room temperature, away from moisture and heat. Other Ingredients: Lactose Monohydrate, Povidone, Talc, Croscarmellose Sodium, Magnesium Stearate, Corn Starch.